An incredible week exploring the arts: visual arts, music and drama led by our talented church volunteers and staff. Breakfast, lunch and all materials included. 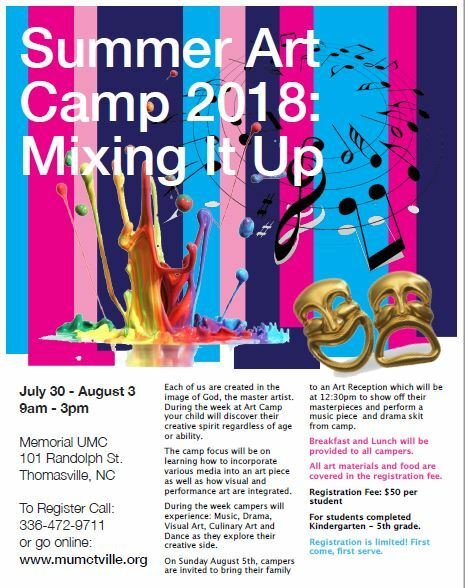 REGISTRATION NOW OPEN FOR SUMMER ART CAMP 2018! During the week children will discover their creative spirit regardless of age or ability. Campers experience: Music, Drama, Visual Art, Culinary Art and Dance. Breakfast, lunch, and all art materials are covered in the registration fee. Space is limited! Be a class assistant, group shepherd, van driver, or meal helper for set-up and clean-up. For MORE INFORMATION, to REGISTER, to SPONSOR a child, or to VOLUNTEER, please call Lynda Hepler at the church office (336) 472-7718 or email: REV. LYNDA HEPLER.